Mali Losinj apartments, Mali Losinj hotels in Mali Losinj. Rent Mali Losinj apartments, a room in Mali Losinj hotels in Mali Losinj. 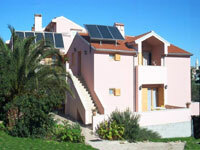 House Laura is situated near to the most beautiful beaches in Mali Losinj. Each apartment has a SAT TV, air condition and dispose of private parking.